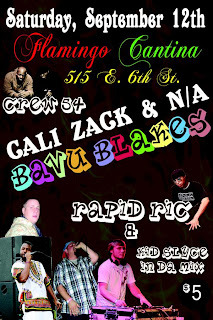 From the don't mess with my health plan department... Bavu Blakes, Crew54, Cali Zack & N/A, Rapid Ric & Kid Slyce @ Flamingo Cantina on Sept 12th! Do you think eating at the Waffle House is healthy?! Dubbed "One of Texas' brightest new stars" by legendary rapper The D.O.C., Bavu Blakes is the ultimate wordsmith by both definitions. This is an artist and writer so unique that he's the only man named Bavu -- meaning 'force' in Kiswahili -- in American history! Equally adept at writing, performing and freestyling, Mr. Blakes offers both clarity and hype. While words and rhymes are clearly where his talents shine, he places equal importance on beats. By defining tracks in terms of mood, rhythm and melody, he makes the music sound better. Creating a sense of cohesion between the lyrics and beats, Mr. Blakes's music reveals this approach through clever, thought-provoking lyrics over diverse beats guaranteed to entice any listener's ear.